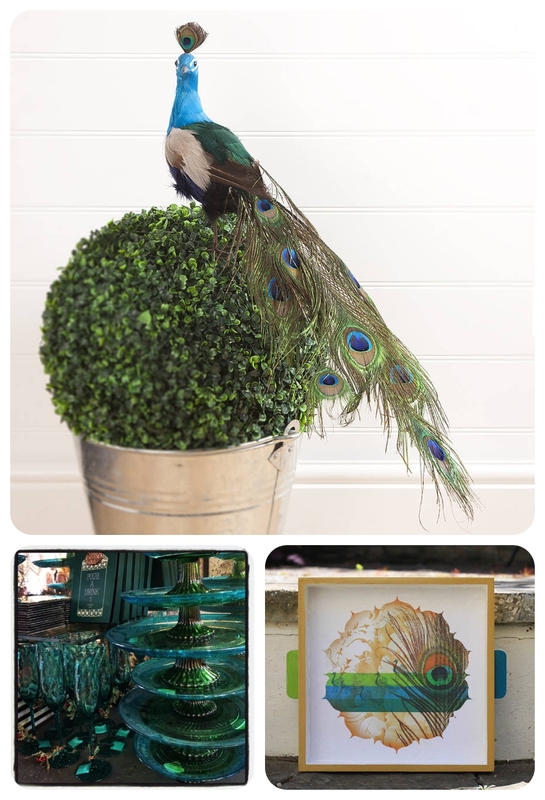 Not only that but Mr M and I actually stayed in a beautiful Moroccan residence called Peacock Pavilions a few weeks ago, coming up soon is a WHOLE blog post on that amazing place! 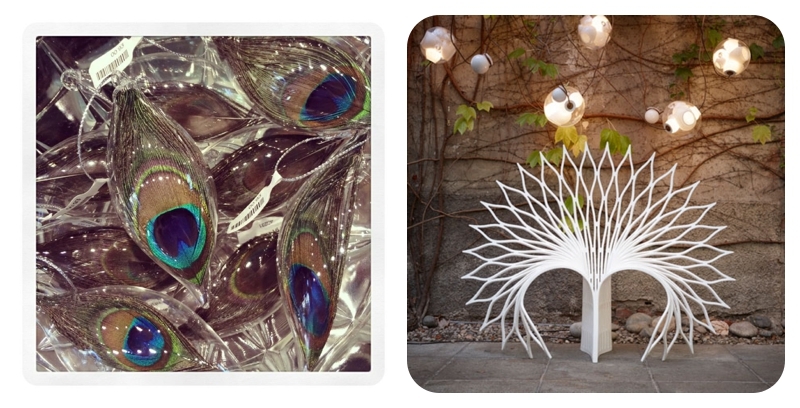 I thought I’d blog some of the things I’ve spotted this year which feature this beautiful interiors trend. 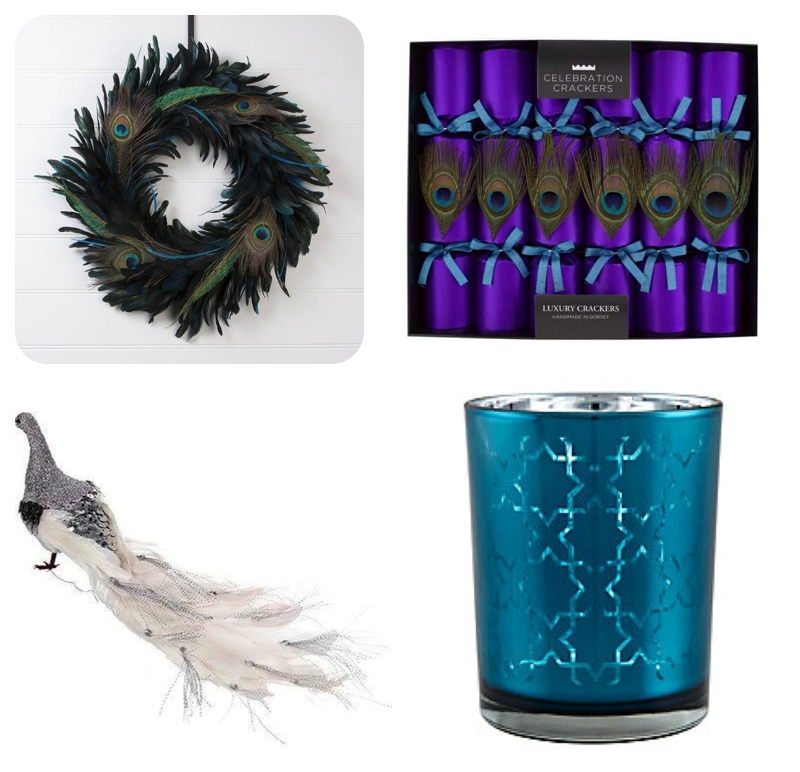 Christmas is just a round the corner and as well as tree decorations, how do you fancy a feathered peacock wreath, eye popping luxury candles, jewelled tea light holders or your very own snowy model? 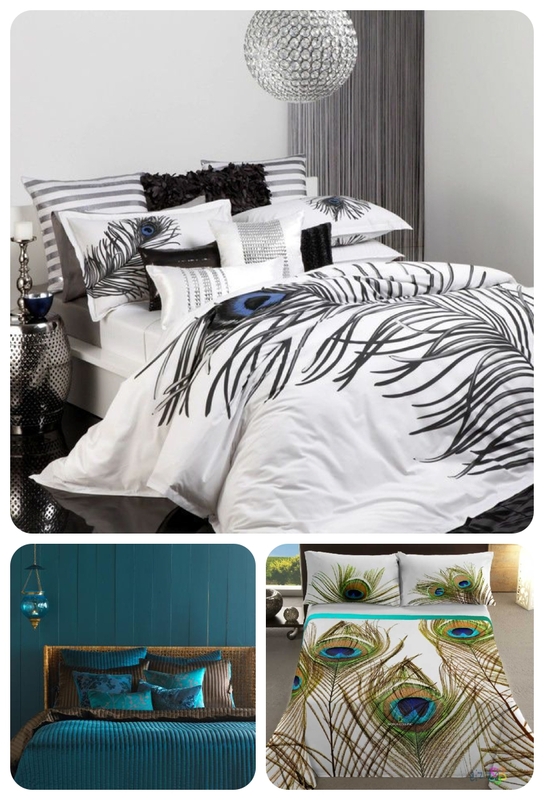 What could be more glamorous than snuggling down in beautiful bedding? 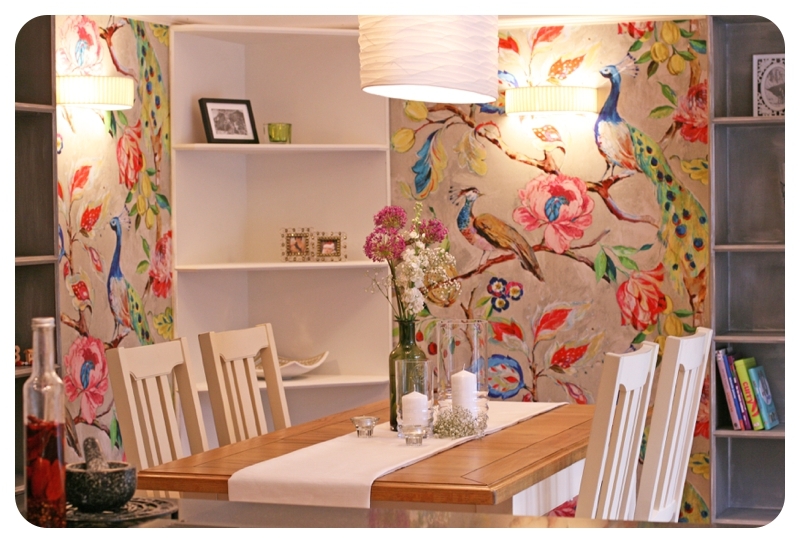 Back in 2011 when we filmed Half Built House for the tellybox, I specified a rather fabulous peacock wallpaper on a taupe background for the dining room area and it looked totally amazing . 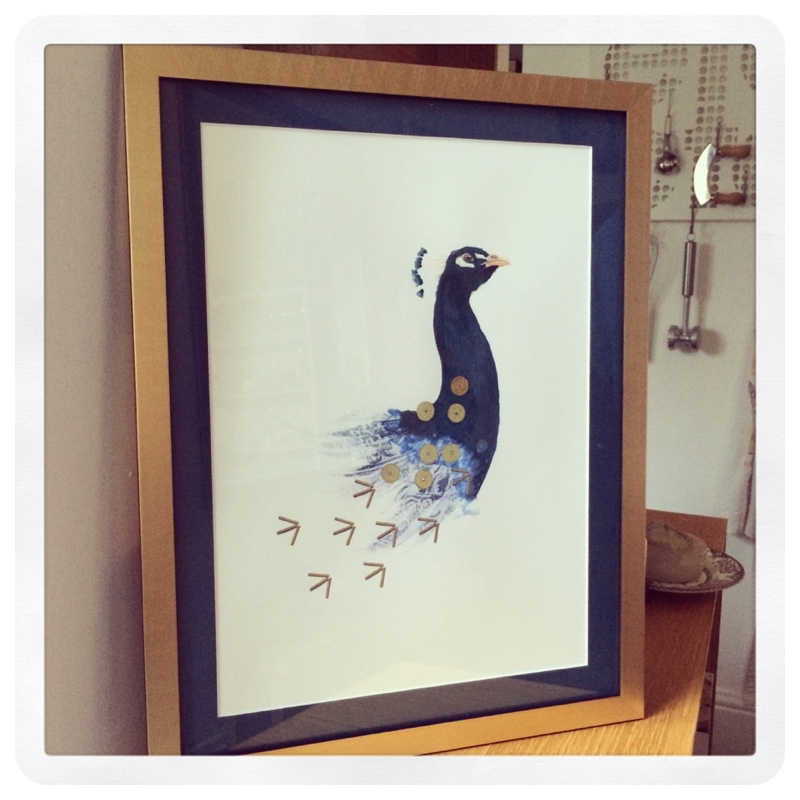 Still adore it! 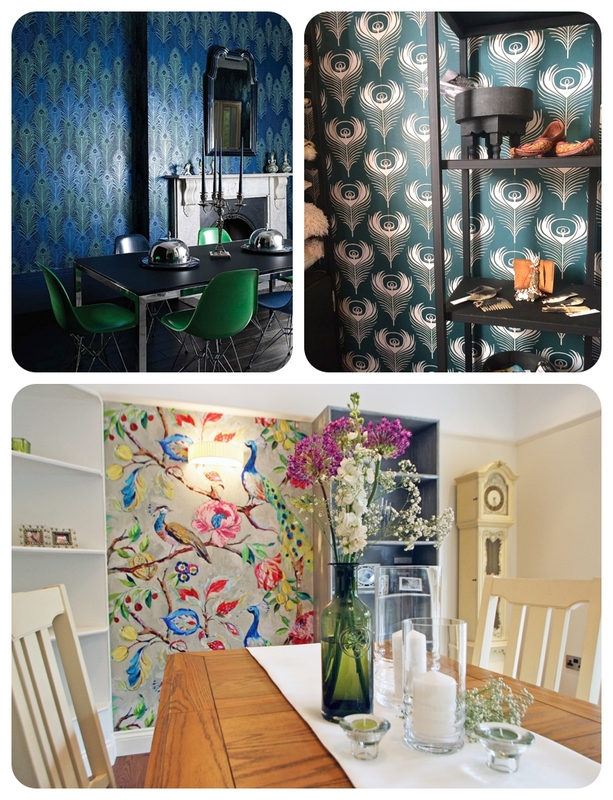 Top left Matthew Williamson, Top right wallpaper at Peacock Pavilions, bottom Prestigious Textiles. 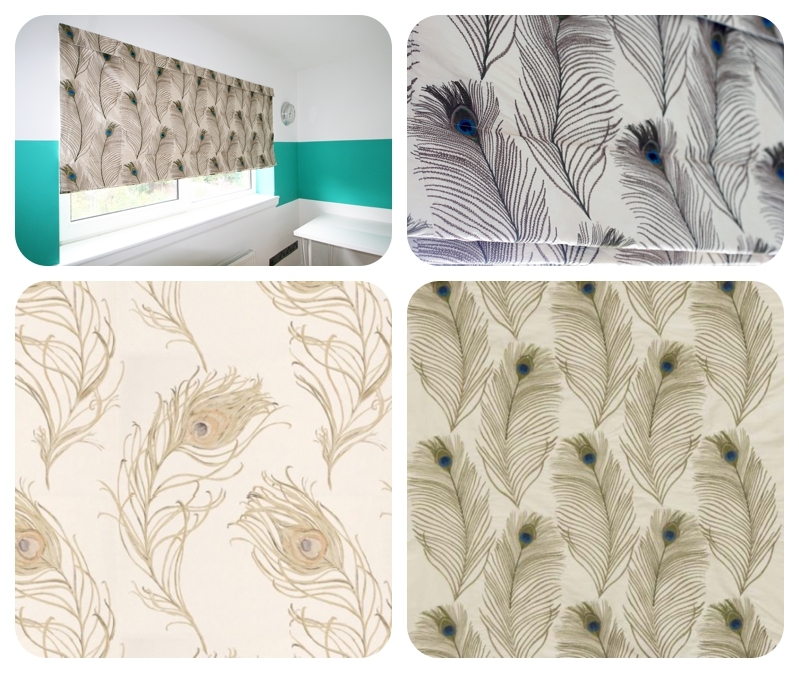 Fabric is also an inexpensive way to update your look, I think peacock feather work brilliantly on Roman or roller blinds like the ones which we did in this home office with it’s vibrant green stripe around the walls. 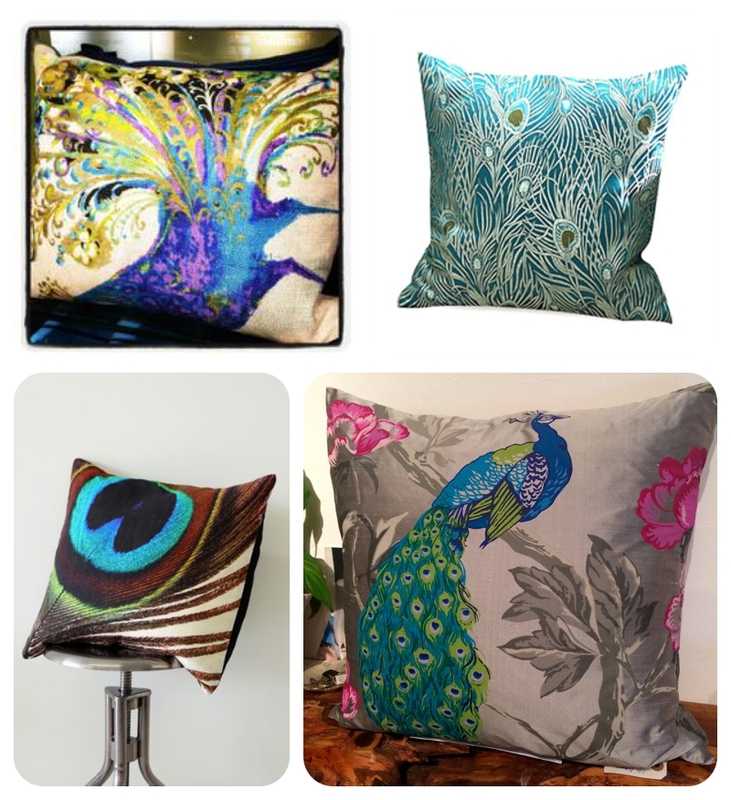 Selection from Prestigious Textiles & others, search online – there are quite a few! 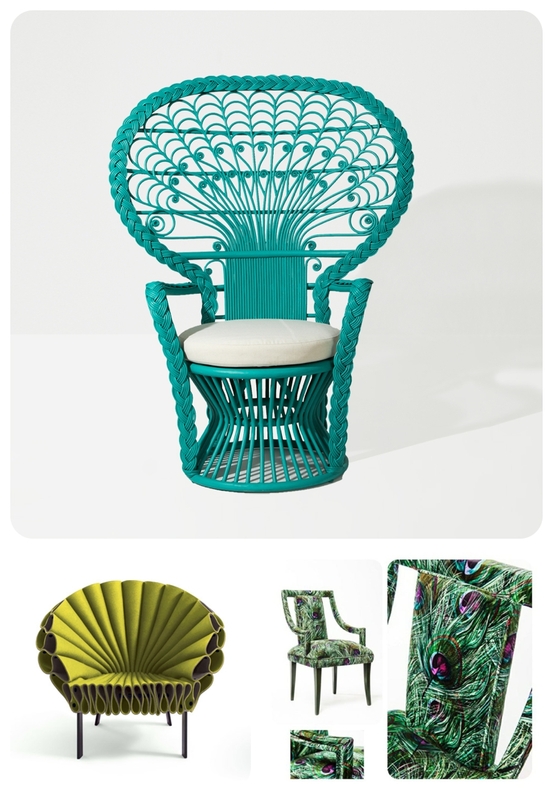 Peacock chairs come in all shapes and sizes, from elaborate rattan numbers in vibrant colours, through upholstered fabrics to cutting edge contemporary designs. 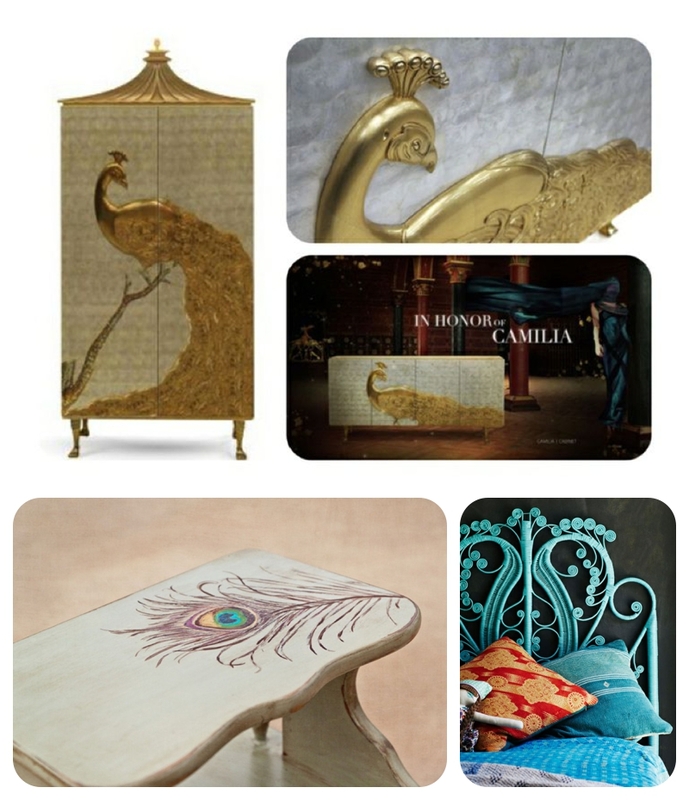 If money’s no object then the Koket Camilia cabinet is a must have – how amazingly intricate is this *dreams of a lottery win*…….. Much more likely is an upcycling project like the clever feather design on a painted table – love this idea! 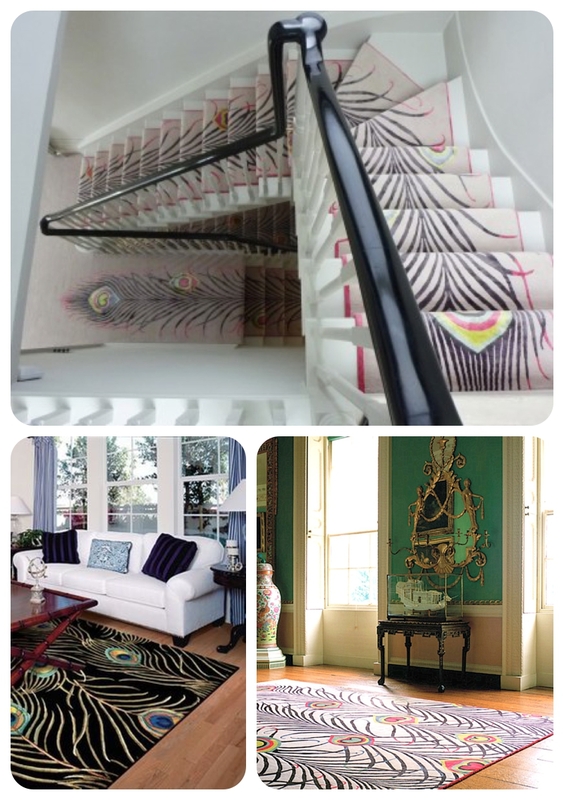 I’m sure you’ve already seen the gorgeous Rug Company Matthew Williamson stair runner, dreamt of by many an interiors blogger, but I couldn’t very well leave it out could I?! 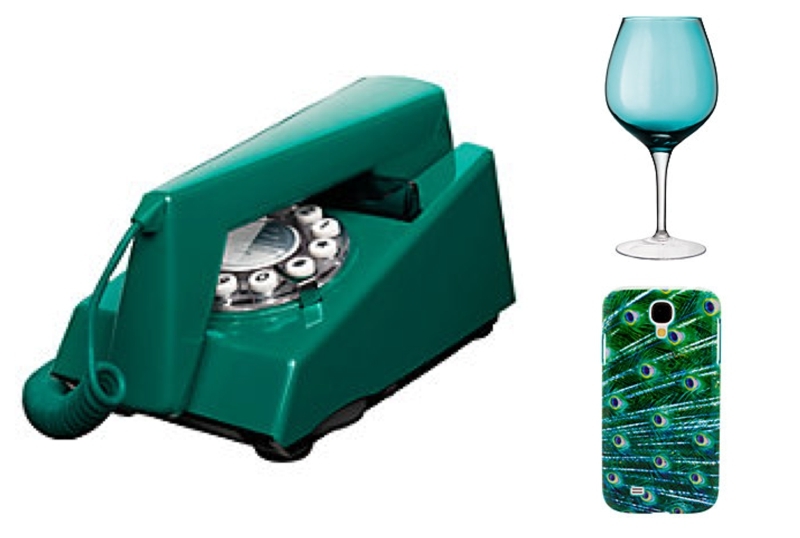 My interiors week: West Elm, Camp & Furnace, Tearooms, Rip Outs & Polka Dots!